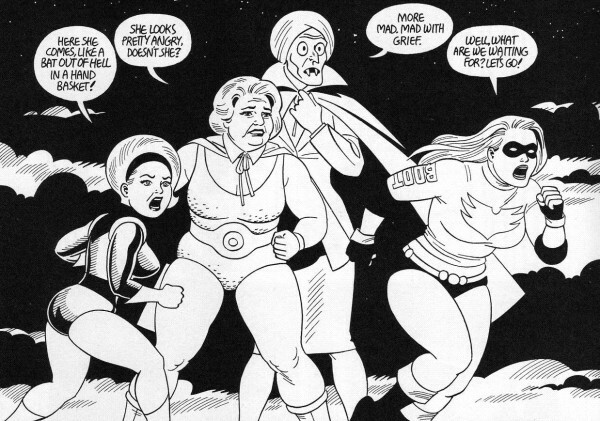 Adafruit’s comic reading list: Love and Rockets Los Bros Hernandez #adafruitcomics « Adafruit Industries – Makers, hackers, artists, designers and engineers! A new edition of Adafruit’s comic reading list — this week, in recognition of National Hispanic Heritage Month let’s take a longer look at Love and Rockets by review of some Hispanic comic characters by Zay, who ships with a humble heart! Los Bros Hernandez are Jamie, Gilbert, and Mario Hernandez. 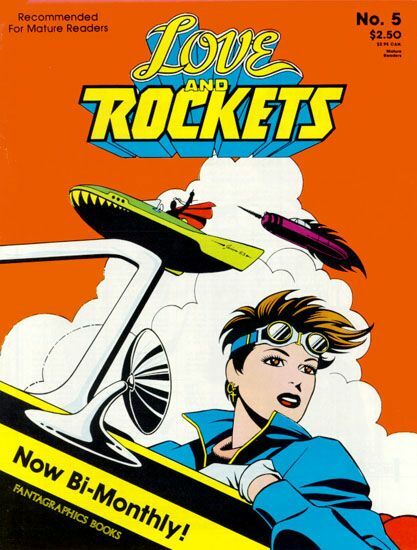 In 1981 they self-published an indie comic called Love and Rockets. Within a year Fantagraphics began publishing the stories to wild astonishment and literary acclaim. It’s difficult to overestimate the impact of Los Bros Hernandez efforts on the world of indie comics. Think about what Pulp Fiction did for movies. It’s that heavy. It can be daunting to enter into the Love and Rockets world. There are well over 30 graphic novels to choose from, and more on their way. Some are written by one brother, some by another. They range from one genre to another. The thing to remember about Love and Rockets is that it’s a universe written by three different people. It’s got the feel of hanging out with three huge personalities from the same family as they tell tall tales. Each of them has a different voice, unique, powerful, imaginative, but with starkly different convictions, all talking about the same vast space. You start with Maggie and her friends, Las Locas. The Locas cycle is perhaps the most wildly entertaining section of Love and Rockets. It begins as a stylized sci-fi story, but it soon moves to Los Angeles where the barrio punk rock scene weaves in with super-spy professional wrestlers and super heroines. But really the Locas cycle is an intimate tale of love and relationships over the course of 30 years. For those of us who read the stories as they came out, the change seemed to happen in real-time. Maggie and Hopey were our friends, working their way through a strange world. It’s an astonishing accomplishment of consistency in character, and about as rare as it gets in comics or anywhere else. 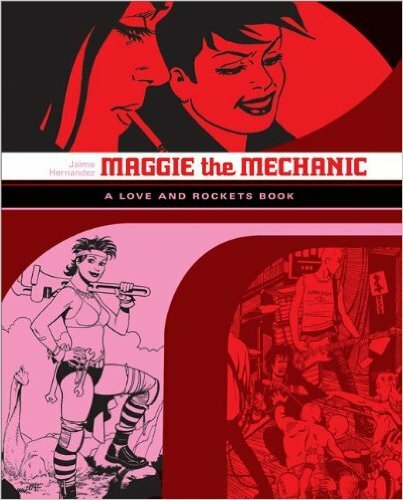 You can get up to date on Maggie and Las Locas with the Fantagraphics omnibus editions: Maggie the Mechanic, The Girl from H.O.P.P.E.R.S., Perla la Loca, Penny Century, and Esperanza. But remember we’re talking about brothers. The Locas cycle is from Jamie Hernandez. 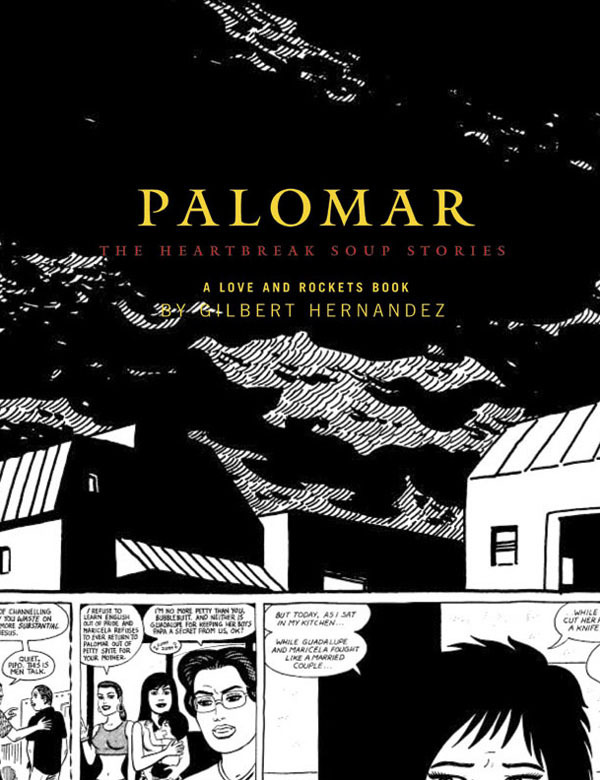 The Palomar cycle, featuring art and writing from Gilber Hernandez, shifts focus from Los Angeles to Palomar, a small town in central America. While Gilbert’s work is still imaginative and complex, his focus is social connections, the inner-workings of towns and families, and the way culture affects us over time. The Locas cycle follows individuals, The Palomar cycle is about generations. A lot of comparisons are made between Gilbert and Gabriel Garcia Marquez, but it does Gilbert a disservice. His approach to Palomar is entirely his own, and while it can stand with the best in Latin American literature, it looks south through the lens of California. If you’re looking for a world to explore, a world made all the more real because we get to see it from different perspectives and styles, check out Love and Rockets. There’s nothing else like it. Check out our previous posts Bee and the Puppycat, Spacetrawler, Grrl Power, Krazy Kat, She-Hulk, King City, The Whiteboard, Hubris, Akira, The Wicked and the Divine, Saga, Are You My Mother?, Cairo, Static, Elfquest, Hip Hop Family Tree, Finder and Peanuts!